Cleaning could not be simpler with this resealable pack of Flash Lemon Cleaning Wipes. Simply just pull out a cloth and apply for an instantly cleaner, fresher surface and reseal the pack to keep wipes fresh. Wipe & Go have been designed to fit around busy lifestyles, treated with Flash cleaning fluid, they are a great way to handle everyday cleaning in one sweep. Not only that but they also leave behind a refreshing citrus scent. 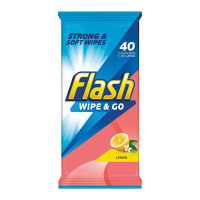 This pack contains 40 wipes.